Sponsoring the New Zealand Rugby League (NZRL) National Secondary Schools Tournament in Auckland this week is one of the ways the Got a Trade? Got it Made! campaign is continuing to show young New Zealanders the value of a career in the trades. “We’re really pleased to be partnering with the NZRL’s youth elite programme to help school leavers into apprenticeships that will let them earn while they learn,” says Rachel Hopkins, Competenz General Manager Marketing and Communications and Chair of the recent Got a Trade Week campaign. Over 600 school students are attending the tournament at Bruce Pulman Park in Papakura. The week’s events include a trades expo to help players find the right career, and the ‘tradie tag team challenge’ where players compete to complete a trades-based activity. Engineering and signmaking are two of the Competenz industries represented in the challenge. The Got a Trade? Got it Made! 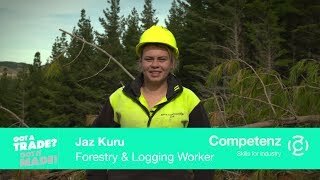 campaign is a national programme that promotes and celebrates careers in New Zealand’s trades and services industries, and the benefits of learning on-the-job. Photo (left to right): Philippa Ivory (Marketing and Sponsorship for NZRL) with members from Competenz and Skills Organisation).